For a luxurious city break the Corinthia is ideal. Great location, sumptuous roomsn, fabulous spa and excellent restaurants. Massages and spa treatments can be booked. The hotel has four different restaurant offering fine dining, bistro classics and authentic Oriental cuisine. The Royal Spa is huge and is available free if you book a deluxe room or above. There are lots of open air markets to browse throughout the city. A sunset boat trip down the Danube is a must! Visit the Royal Castle Museum which encapsulates Hungary and Budapest's history. Our mission is to provide our guests with the "Craftsmanship of Care‟. In a world of mass produced experiences, we offer to our guests the made-to-measure. We believe the attention to detail that elevates a craftsman can similarly elevate the experience of visiting our hotel. This sentiment is embedded in everything we do, and everything we say. The Craftsmanship of Care reveals itself in everything from the way our guest is welcomed, to the comfort of the room they are offered, to the thoughtfulness of the people who serve them. Our pillars are authenticity, understanding, precision and passion, the bases of the Corinthia Spirit. Budapest is more than ready to take its place as one of Europe’s most inviting, and intriguing, cities. Architecturally, it boasts buildings from baroque to contemporary eras, the art scene is booming and its café culture, born from bohemian roots, is still at the heart of what makes this romantic city tick. Straddling the Danube River, with historical Buda to the west and buzzing Pest the east, Budapest is a fantastic city for business, nightlife and relaxation. A lavish, delicious and luxurious buffet breakfast as the first experience of the day. We offer a sumptuous selection beginning with our organic corner with bio products through homemade smoothies and bakeries till the live kitchen. From fine dining, to a casual meal or even a late-night drink, Corinthia Hotel Budapest presents the perfect spot for breakfast, lunch, dinner, or cocktails in central Budapest. Offering authentic dishes from across the Orient at the Rickshaw Restaurant to the eclectic flavours of Bock Bistro, one of the best restaurants in Budapest, every palate is catered for. Brasserie & Atrium restaurant offers the best of international and Hungarian cuisine. The consistently excellent quality and the constantly renewed menus are the trademarks of our Executive Chef,Péter Bolyki, while cocktail connoisseurs can experience exquisite drinks at Le Bar. Caviar&Bull Budapest is a real gem which walks in the footsteps of its Maltese counterpart, yet ensures a clear Hungarian imprint in its menu with key staples of the Hungarian cuisine. Neutral shades of taupe and light grey adorn the walls, contrasted by flashes of jewel tones from furnishings, while the stunning glass panel makes a striking addition to the bedding and velvety carpets. Homely, spacious,and airy, our Executive Suite is a refreshing and utterly relaxing oasis of modern interior design. This stunning suite, measuring 70m²/753ft², features a bedroom, an expansive living room, two separate bathrooms, bathtub, shower and a walk-in wardrobe. Extra beds can be placed in every room and suite. The stay and the other services (spa, F&B) under the age of 6 is free. 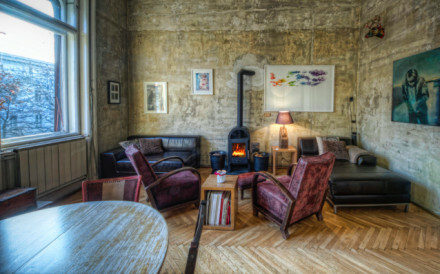 The accommodation is available at a discounted price for children between 6 and 12. F&B provide a 50% discount for children between 6 and 12, and the Royal Spa provides also 50% discount for children between 6 and 16. Children under the age of 16 are only allowed to use the swimming pool every day between 11.00 am and 3.00 pm. Children under the age of 16 must be accompanied at all times by an adult who is a competent swimmer. The gym is only available from the age of 16. Our treatments are not conducive to children, therefore we are not able to accept appointments for children under the age of 16 years. During Sunday Brunches our Brasserie&Atrium restaurant await the children with games at the kids corner and we also provide kids’ amenities upon request. 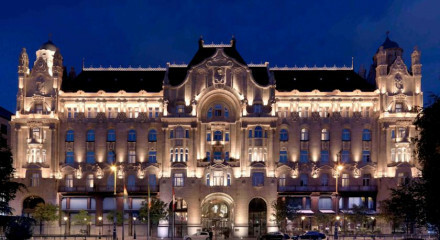 The property is one of Budapest's original luxury hotels. It opened its doors in 1896.